Fishing for trout with a nymph is one of the best ways to catch big trout. You can fish for trout with a nymph in many situations and have success. They key is knowing how to fish the nymph and where to cast. Joe Humphreys will share his knowledge and teach you the best ways to catch wary trout on a nymph. 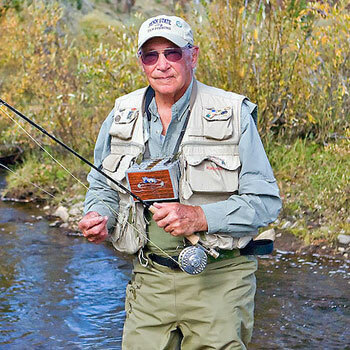 Adventuresome angler Joe Humphreys has demonstrated his passion for angling, water, and wildlife throughout his life and career as a fly fisherman. He’s an educator and conservationist who has taught fly fishing for more than 40 years, including directing Penn State's angling program. He is also an author of the two highly acclaimed books, Joe Humphreys Trout Tactics and On the Trout Stream with Joe Humphreys, and done many articles in regional and national periodicals. Joe’s three favorite nymphs are stone fly nymph, pheasant tail and prince nymph. He tie stone fly in number 12 or 10 on a 2x long shank hook and tie it like the George Harvey’s stone fly. It has a dark brown back and a yellow underneath tummy with wings tied off each side and a tail. George Harvey’s stone fly is the all-time most consistently effective nymph And it is the favorite from Labrador to California. And the best thing about stone flies is that it can imitate a mayfly which is also effective way to fly fish for trout. Also the pheasant tail welk represents a lot of the mayflies and works well from coast to coast. The other hand, prince nymph works very well throughout the west and the east. Select your nymph depending on the season and the hatch. April, May or early season may have many hatches so you need to do your research. Whatever your selected nymphs, you must know how to tie them properly to do well n the water. Fly tying is an art that has been practiced for hundreds of years. Flies may be tied according to some existing pattern or the design made up by the individual tier. The way you tie your fly greatly affects the movement of your nymph which is important. Joe’s tips about tying flies are to flatten your nymphs and tie the wings out to the side. Use a 34 gauge beading wire, a brass wire, or the thread through the body of the nymph and flatten the body so the water across that flattened surface of a nymph, rocks it back and forth. The water moving the nymph on that flattened surface, moving it back and forth and those wings make it come alive. Also, in any conditions you’re fishing, use as long a rod as possible. Joe prefers 9-foot rod, with 6-weight line so he can keep a lot of line off the water and have better line control. Hold your fly in the productive water as naturally and as long as you can so with a longer rod, you can hold it in those velocity changes, those pockets, those cuts where the fish hold, you’re holding it long enough for those fish to see it and time enough for it to come to them naturally and time enough for them to pick it up naturally. Finding a section of river that has all the spots trout like to hide. Swift currents with slower pools, large boulders and fallen trees are good choices. The most effective technique to reach those fish behind the boulders is to position yourself up stream from your chosen spot in an area where you have good footing and are slightly hidden from the trout. It’s not always possible but you have to position yourselves for the best results. Sometimes you can come in behind the boulders, if you aren at a distance, tuck the cast to avoid lining the fish. Brush fishing for trout offers some classic springtime fishing action. Flooded brush is anticipated by many seasoned pros as a great time to tie into some hefty lunker trout. When the water level rises enough to cover the shoreline brush, trout move tight into that cover. They're accessible, aggressive, and there's nothing quite like it! Remember too, that flooded brush can be productive any time the water levels are high, not just in the spring. Flooded brush provides excellent trout cover and should always be fished, regardless of the season. According to Joe brush fishing is a game of its own. The casting techniques and the approach, everything is relative to the surroundings. The secret of brush fishing is the casting stroke. In Fly fishing, it is important that you are good at casting your rod or you are going to have some problems actually catching the fish. What Joe likes in a fly for night time fishing is when he’s fishing a dry fly hatch and he’s nymphing after dark. Night fishing is definitely a marvelous time to go trophy trout fishing. Night fishing is exciting because this can be a great advantage for anglers to conquer their most sought after prey, the brown trout. Big browns days and nights are turned around. Most of their feeding is at night. They do their activities at night, in the dark, the trout has a lesser ability to sense shadows, perceive noises, and see their surrounding – they feel safer. They can't sense the things that normally would deter them from feeding. One thing you need to have when you’re a night fisherman is patience. Most people go out at night for fishing for an hour or so and then they get tired. Well, stay with it, pack a lunch, have your hot coffee and sandwiches, relax and listen to the night sounds. It’s glorious in the summertime then go to work. And when you take that big one, you’ll never forget it. Listen to our full interview with Joe Humphreys and learn more general tips and ideas on Nymph, Brush and Night Fishing for Trout.